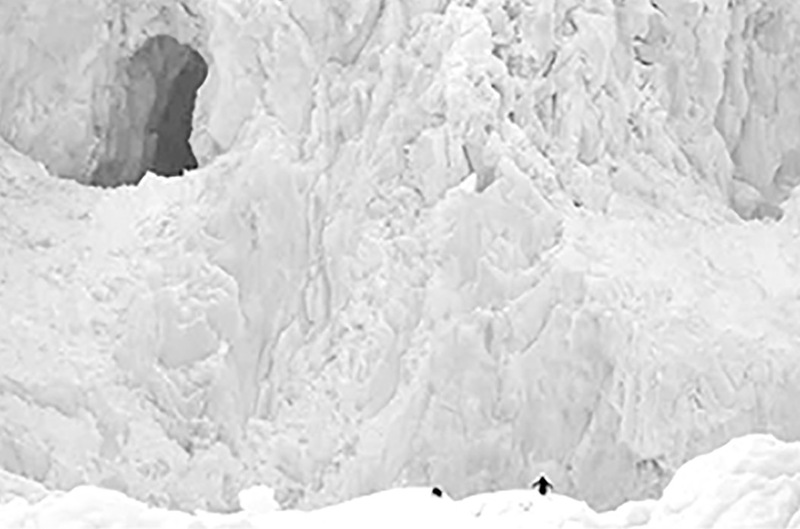 Two penguins are barely visible against the dramatic ice bank at Cierva Cove in Antarctica. Editor’s Note: The author is an SHS science teacher who was chosen by the National Geographic and Lindblad Expeditions for an expedition to Antarctica in December. Both my roommates (teacher Dan Kinzer from Hawaii and Donnie Piercey from Kentucky) and I jump out of bed, grab our camera gear, throw on our jackets, and begin to run toward the bow of the ship. Other tired travelers are stumbling out of their rooms in a similar state, fumbling at jacket zippers, dark shadows under their eyes. We exit out into full daylight and join a small group of people, some with binoculars at eye level and others with cameras on the ship’s bow. Not 70 feet away, we see the pod surfacing, their telltale gray and white patches breaking through the water and a ripple of excitement runs through us all. Just like that our massive 400-foot ship – the National Geographic Explorer – becomes miniaturized, a toy in the midst of something truly enormous. Antarctica. Rugged and beautiful and unforgiving. In front of us a dramatic scene of life and death unfolds – the fear in the eyes of those seals a testament to the rawness of this place. Here, we are a blip on their radar, land bound witnesses to their undersea lives, just trying to catch a glimpse, to bear witness. In these moments I feel the echo of our collective past – when we were wild – and even though I know that I’m on the outside looking in, it feels good. To be honest, outside of the penguin question (National Geographic would have frowned at that), those are pretty difficult questions to answer. Just how was Antarctica? What did I see? Was it like I thought it would be? I don’t think I have an adequate answer for any of those questions yet. But I can feel them coming. Antarctica is a place like no other. It is as cold, as windy, and as strange as you imagine it is. It’s rough in its beauty, and it’s no place for a human. The long list of people who have died there – often just passing by – proves that. So why go? I guess that’s particular to the visitor. It’s a long way from the Bahamas and a relaxing vacation, but it’s not without its perks. I guess for most, like me, it’s all about the extremes. The days seem much longer than 24 hours – the light changes of course, but the sun never truly sets. Dusk comes, and settles over the expanse with either grayness, or if you’re lucky, an intensity of orange and pink and crimson. Then the sun rises again. All the while you’re surrounded by a grand panoply of animals; daily humpback sightings, chinstrap, Gentoo and Adelie penguins walking right next to you, leopard seals patrolling the beaches, Weddell seals basking lazily as you snap photos mere feet from their faces. And then there’s the ice, the other worldly ice. Making loud thumps on the ship’s hull as you try to sleep, floating by while you’re writing in your journal, having dinner, or talking with a friend. The diversity of shapes and sizes is hard to explain. Some of them are the size of a ghostly blue football stadium, and others are far svelter, whittled down from their travels. My advice though – go in summer. Winter in Antarctica is an extreme best left for the pros. Another question I received a lot is “How are you going to use this for your classes?”– to which, again, I have no good answer. “I’m not sure.” If you read my blog, you might remember me writing something about how I felt that in my life there would be before Antarctica, and after. I still feel the same way. Something in me has shifted; a cog has moved that was maybe stuck, and I’m now waiting for the wheels to move. I know this – the frailty of our planet was obvious there, and as a science teacher the tie-ins were everywhere. For example, as I sat in a Zodiac one morning with the other two Grosvenor Teacher Fellows, Jonathan Zaccaraia (a Lindblad naturalist), and Dr. Erin Pettit, a glaciologist and National Geographic Explorer, I both heard and saw the warming of our planet playing out right here. The walls of an ancient glacier were crumbling (calving) into the sea 246 meters from us. Dr. Pettit, using a hydrophone, was recording the release of gases bound in the melting glacial ice while simultaneously recording the conductivity of the water. She had asked us teacher types to give her a hand, so while Dan recorded data points for her, and Donnie lowered the conductivity probes, I used a range finder to calculate how far we were from the glacial wall. Minutes later, while I was describing this scene to the whole school over the intercom using a satellite phone the school had rented for me, a chunk of ice far larger than my classroom broke free and crashed into the ocean, creating a seiche wave that caused the brash ice (fragments of ice less than two miles across) all around us to jostle together, creating a strange clinking sound. It’s a sound I can still hear in my head. Talk about real life science! How much more real can you make it for your students? In retrospect, outside of the mystery of being in Antarctica, certain truths need to be communicated. For one, I am so honored to have been chosen to go. I am forever in debt to National Geographic and Lindblad Expeditions for creating a program like this. The 40 teachers in this year’s cohort have become colleagues, and the learning we are doing together is something I wish all teachers had the chance to experience. subject matter in a place outside of a classroom, our minds open in unexpected ways. Travel teaches what books cannot, and there is no substitute for direct experience. Third, we need to take better care of this planet. It is more beautiful, diverse, and fragile than we realize. Lastly, we need to get outside and be a part of what is happening in the natural world. As I’ve said, it’s an amazing place. You don’t need to go to Antarctica. We live in one of the most beautiful places in the United States. And when you go, take someone small with you. They need us to show them around because they aren’t doing it on their own anymore, and the benefits of being outside couldn’t be clearer (check out Richard Louv’s seminal Last Child In the Woods for more information). If you’re interested in learning more about my expedition, check out my blog at https://kaputantarctica.blogspot.com/. For more about Dr. Pettit’s awesome program that seeks to inspire teenage girls to build critical thinking skills, gain self-confidence, and make lasting friendships via tuition-free wilderness science experience, go to www.inspiringgirls.org. As I edit video, you can find it on my YouTube channel at https://www.youtube.com/channel/UCfw4Cvccb85dBLCy0pfv_Tw?view_as=subscriber A lot of the material is geared toward the classes I teach (and my videography skills are, well, not so good). Lastly, I’m always up for good conversation – reach out!